On Episode 125 of The Coin Show Matt and Mike talk about grading sets, The Coolest Thing To Walk Into Matt’s Shop and the news in the world of coins. Click here for links to the news stories Mike and Matt picked during the news! Enjoying the episodes, and, excited to hear new ones from you two guys !!!! Keep up the awesome work of course. ~ Cheers , from Michigan !!! …. Maybe you guys can do another show on unique varieties that you guys have found that you cannot find listings for , and , what people should be expecting some to auction for ? And / or , is it worth taking it to a coin shop ? OR will an auction likely bring more money ? Oh I found you touched on variety errors in episode 119 !!!! … . Yes I’m playing a marathon hahahahaha. Any additional information that comes to mind will help of course. But, yes, closed “E bay” listings is a good place to look of course. * * * OH I know what to ask , what should be an expected percent a coin shop would typically pay less ? Obviously they have to “keep the lights on” , right ? Hey Matt & Mike, I’m a new listener to the show. I started with ep.125 but am quickly going through the back episodes. 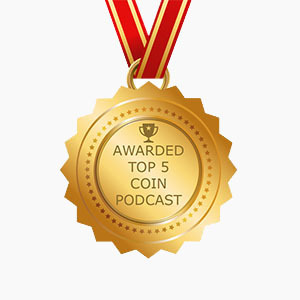 I come at coins probably from a different perspective than most of your listeners. I’m an estate auctioneer in Gloucester, MA and I’m working on making coins more a part of my general merchandise inventory – so, I may be what you’d consider a “hack”. Up until now, I’ve not though much about coins other than as another category for my re-sale inventory, but your show has been changing that! Listening to you guys has got me interested in the history and back-stories of coins that I am only used to appreciating with the antiques and collectibles I sell, so thanks for that! My question is, as relative newbie, what back episodes do you think I’d b benefit from the most as far as getting some of the basics under my belt?